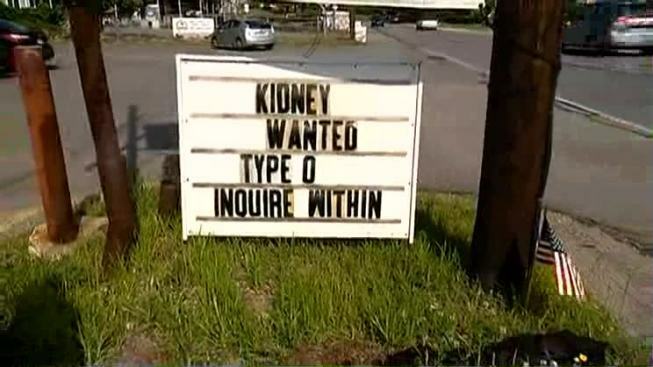 A Salem, New Hampshire woman with polycystic kidney disease is in desperate need of a kidney and her husband has found a unique way to find one. Common Grounds coffee shop has been on Route 97 in Methuen for decades, but the sign out front just a few weeks old. "I put it up on a whim," said restaurant owner Wayne Bernard. But he never consulted his wife. "Oh, oh my God," said Kiki Bernard laughing. "Oh no." Kiki said she would've gone about this much differently than her husband did. "Something more sympathetic, not just, 'inquire within,'" she said smiling. But it turns out Wayne's simple words are working. "It just clicked that I needed to try and do this," said Salem resident Christine Schafer. Schafer is one of at least a dozen customers and passersby who are in the process of being tested as a potential match. "It would mean the world to me to help someone like her," Schafer said. "She has a heart of gold, she's a wonderful person." "It's been so overwhelming, the generosity of people has been amazing," Kiki said. "They're saving my life, they really are." The sign has been up for just five weeks and Wayne said it'll stay until they find a donor, at which point, he'll simply change the message. "Thank you, thank you, thank you," Wayne said. Kiki chuckled, saying, "And I will leave that up to him." Kiki is on a transplant list, but she said it will be six years before she gets a kidney that way, so she's incredibly grateful her husband came up with this idea. The couple has left Tufts Medical Center donor applications at the coffee counter for any customer who might be interested in helping out.